According to the parking violations data from the city of Boston, 147,000 dollars are collected per weekday in parking ticket related violations. This number, combined with our own parking experience frustrations, spurred us into action to create our visualization map using the data provided to us by the city of Boston. Our goal in this project was to provide the city of Boston with data that could be analyzed and compared to make the parking enforcement operations more successful and efficient for the people of Boston. 147,000 dollars is an unacceptable number when people could be putting this money back into growing the economy. This money could be better spent opening new businesses, paying off student loans and other kinds of debt, and creating savings that can be used for big purchases in the future like houses and condos. Our visualization tool is accompanied with a bar graph that together could be used to efficiently forecast and better manage the parking enforcement for the people of Boston. Our tool could help city officials see the most violations per street from any time which could lead to more efficient and better laid out city planning. With comparative analysis and the use of our tool, a public transportation official could make decisions using the data that could locate faulty signs, unclear sign locations, and even could shed some light on possible parking enforcement error thanks to the visualization of the high ticketed areas. 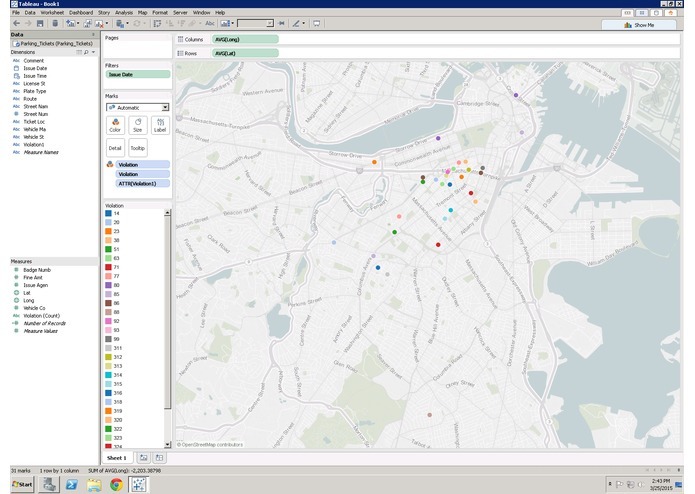 With more time and live data from the city, our tool could even be developed into an app and designed in a way to help the people of Boston deal with their individual parking enforcement issues. The visualization map and bar graph is just the beginning of what could be done. Our team believes it starts with the public policy officials first. Once they can make good decisions using the data, than you can start designing and filtering an app that could be released to the public. The tool our group created is primitive in it's current stages. With more time we could develop a cleaner product, but we feel confident that our submission is high quality product. We narrowed our focused to the public officials making the decisions. With more time and resources our tool could be further developed in many different ways. This tool is just the beginning of what could be done with live parking data from the city of Boston. Our tool, like any good software or business, could evolve in many different ways. This is just the beginning of what could be accomplished. Thank you for considering our submission. Thank you for being apart of Hub Hacks and a bigger part of the Boston community. Thanks for taking time away from your own personal time to volunteer in judging these submissions. We are very happy to be apart of the this city and are beyond excited to get the opportunity to improve on some of the ways the city manages it's public policy. I(Mitchell Law) was responsible for leading our fantastic group. I found the members, organized our meetings, and kept us on task during our meetings and brainstorming. The biggest challenge was organizing all our schedules to make this work. Khin and I are students at UMASS Boston which made this particularly difficult in managing our work, school, and project schedules. We made it work, however, and feel like we were able to contribute a quality product to Hubhacks and the city. A special thanks goes out to Hubhacks for holding these events. Events like these bring the community together, and help bring efficiency and updated technology to solve city wide problems. With enough people and support anything is possible.